The Past Perfect Continuous is another tense that expresses the "past in the past". In this lesson we look at the structure and use of the Past Perfect Continuous tense, followed by a quiz to check your understanding. Note that continuous tenses are also called progressive tenses. So the Past Perfect Continuous tense is sometimes called the Past Perfect Progressive tense. How do we make the Past Perfect Continuous tense? For negative sentences we insert not after the first auxiliary verb. For question sentences, we exchange the subject and the first auxiliary verb. + You had been playing tennis. - It had not been working well. - We had not been expecting her.
? Had you been drinking?
? Had they been waiting long? When we use the Past Perfect Continuous in speaking, we often contract the subject and the first auxiliary verb. We also sometimes do this in informal writing. He'd been drinking all day. It'd been pouring with rain. We hadn't been living there long. They hadn't been studying very hard. 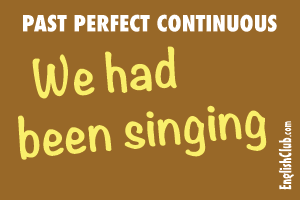 How do we use the Past Perfect Continuous tense? Ram started waiting at 9am. I arrived at 11am. When I arrived, Ram had been waiting for two hours. Ram starts waiting in past at 9am. I arrive in past at 11am. John was very tired. He had been running. I could smell cigarettes. Somebody had been smoking. Suddenly, my car broke down. I was not surprised. It had not been running well for a long time. Had the pilot been drinking before the crash? You can sometimes think of the Past Perfect Continuous tense like the Present Perfect Continuous tense, but instead of the time being now the time is before. "I am angry. I have been waiting for two hours." "Ram was angry. He had been waiting for two hours."